How does the differentiator block look like? The input of the differentiator block is the scalar signal to be differentiated. The differentiator provides two output signals. 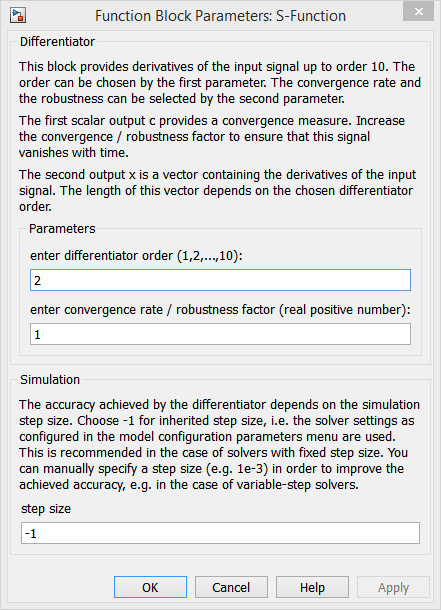 The first output, which is labeled c and is a scalar signal, indicates whether the estimation errors of the differentiator vanish. The second output, which is labeled x, is a vector whose length equals the selected order of the differentiator. The elements of this output are the estimates of the derivatives of the input signal in ascending order, i.e. the first element of the output x is the estimate of the first derivative, the second element of x corresponds to the estimate of the second derivative, etc.